A Year of Being Here: David Whyte: "Everything Is Waiting for You"
"Everything Is Waiting for You" by David Whyte, from Everything Is Waiting for You. © Many Rivers Press, 2003. 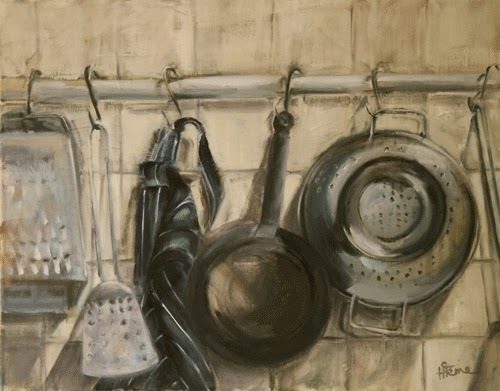 Image credit: "Pots and Pans," oil on canvas, by Hazel Ferrie (originally color). A loved one forwarded this to me today... I needed it, right now, this moment... and so, my perception indelibly altered, I venture into the conversation. Thank you M.
I made the great mistake again... out of habit... out of fear... of appearing weak - a failure... and so my loved one reminded me once again... and again. Thank you M.